Starting with GWT 2.3, the GWT SDK provides support for HTML5 client-side storage, also known as “web storage”. Using the GWT library’s Storage capability enables your web application to take advantage of these storage features when running in an HTML5-compliant browser. The HTML5 (web) storage spec is a standardized way of providing larger amounts of client-side storage and of more appropriately “partitioning” session storage and locally persistent storage. The HTML5 spec also provides for storage events to be generated and handled by interested listeners. The full impact of these features provided by HTML5 storage can best be seen by looking at client-side storage in the non-HTML5 world. Without HTML5, client-side storage for web applications is limited to the tiny storage provided by cookies (4KB per cookie, 20 cookies per domain) unless proprietary storage schemes are used, such as Flash local shared objects or Google Gears. If cookies are used they provide both session and locally persistent storage at the same time, and are accessible by all browser windows and tabs. Domain cookies are sent with every request to that domain, which consumes bandwidth. The “mechanics” of processing cookies are also a bit cumbersome. In contrast, HTML5 storage provides a much larger initial local storage (5MB per domain), unlimited session storage (limited only by system resources) and successfully partitions local and session storage so that only the data you want to persist is persisted in local storage and data you want to be transient stays transient. Moreover, session storage is only accessible from its originating tab or window; it is not shared between all browser windows and tabs. Accessing session and local storage is simple, consisting in simple reads and writes of key-value strings. Finally, local and session storage are client-side only; they are not sent with requests. With HTML5 local storage, a larger amount of data (initially, 5MB per application per browser) can be persistently cached client-side, which provides an alternative to server downloads. A web application can achieve better performance and provide a better user experience if it uses this local storage. For example, your web application can use local storage to cache data from RPC calls for faster startup times and for a more responsive user interface. Other uses include saving the application state locally for a faster restore when the user re-enters the application, and saving the user’s work if there is a network outage, and so forth. Note: The 5MB maximum applies to local storage only, not to session storage, which is limited only by system memory. Note: unlike cookies, items in Storage are not sent along in requests, which helps reduce network traffic. To use HTML5 storage features, you need to know about lifespan (persistence) of local and session storage, about their scope–which windows and tabs can access the storage, and which tabs and windows can listen for storage events. 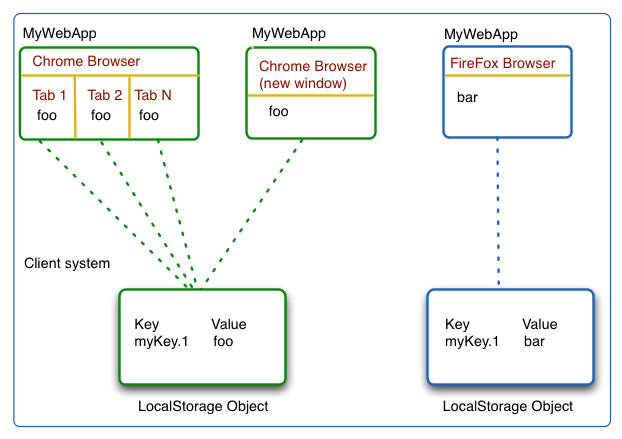 HTML5 Web Storage defines two types of key-value storage types: sessionStorage and localStorage. The primary behavioral difference is how long the values persist and how they are shared. The following table shows the differences between the two types of storage. HTML5 local storage saves data in string form as key-value pairs. If the data you wish to save is not string data, you are responsible for conversion to and from string when using LocalStorage. For proxy classes used with the GWT RequestFactory, you can use RequestFactory#getSerializer() to do string serializing. For non-proxy objects, you could use JSON stringify and parse. **Note: **Just like cookies, LocalStorage and sessionStorage can be inspected using browser tools such as Developer Tools in Chrome, Web Inspector in Safari and so forth. These tools allow a user to remove storage values and see what values are being recorded by a web site the user is visiting. HTML5 local storage saves data unencrypted in string form in the regular browser cache. It is not secure storage. It should not be used for sensitive data, such as social security numbers, credit card numbers, logon credentials, and so forth. When data is added to, modified, or removed from LocalStorage or SessionStorage, a StorageEvent is fired within the current browser tab or window. That Storage event contains the storage object in which the event occurred, the URL of the document to which this storage applies, and both the old and the new values of the key that was changed. Any listener registered for this event can handle it. **Note: **Although the HTML5 spec calls for Storage events to be fired in all tabs of the same browser or all windows of the same browser, few browsers currently implement this. Syntactic details for these can be found in the Storage feature javadoc. You get the storage object by invoking Storage.getLocalStorageIfSupported() or Storage.getSessionStorageIfSupported(), depending on the type of storage you want to access. Because your web app might be accessed from a browser that does not support HTML5, you should always check before accessing any of the HTML5 storage features. If the storage feature is supported, you get the storage object and then write data to it or read data from it, depending on your needs. If you want to delete one key-value pair from the storage, you can do that or you can clear all of the data from the storage object. GWT provides a simple way to determine whether the browser supports HTML5 storage–a built-in check when you get the storage object. You use Storage.getLocalStorageIfSupported() or Storage.getSessionStorageIfSupported(), depending on which type of storage you want to use. The storage object is returned if the feature is supported, or, if not, null is returned. If the browser supports HTML5 storage, the Storage.getLocalStorageIfSupported method creates the storage object if it doesn’t exist yet, and returns the object. If the storage object already exists, it simply returns the already-existing object. If the browser doesn’t support HTML5 storage, this returns null. The Storage.getSessionStorageIfSupported() method works in the same way. Data is stored as key-value string pairs, so you need to use the key to get the data. You either have to know what the key is, or you’ll need to iterate through the storage using indexes to get keys. Picking good naming conventions for keys can help, and the use of StorageMap can be useful as well. If the data needs to be converted from string, you are responsible for doing that. The following snippet shows an iteration through the contents of storage, with each item in storage then being written to a separate row in a FlexTable. For simplicity, this assumes all of storage is used only for that FlexTable. If you want to quickly check whether a specific key or a specific value is present in the storage, you can use the StorageMap object by supplying the storage to the StorageMap constructor, then using its containsValue() or containsKey() methods. In the following snippet, we use a StorageMap to see if a certain value is already in the storage, and if it is not yet stored, we write the data to storage. To write data, you supply a key name and the string value you wish to save. You can only write string data, so you need to do any conversions from other data types or from objects. (If the object is a proxy used with the GWT RequestFactory, you can use RequestFactory#getSerializer() to do string serializing. For non-proxy objects, you could use JSON stringify and parse.). Judicious use of naming conventions can help with processing storage data. For example, in a web app named MyWebApp, key-value data associated with rows in a UI table named Stock could have key names prefixed with MyWebApp.Stock. In the following snippet, which is part of an Add button click handler, a text value is read from a textbox and saved, with the key name concatenated from a prefix and the current number of items in the storage. You can delete a single key-value pair of data from the storage or you can delete all the data all at once. // Listen for mouse events on the Clear all button. // note that in general, events can have sources that are not Widgets. You can register storage event handlers with a storage object, and these are invoked for the current window or tab when data is written to or deleted from the storage. Although the HTML5 spec states that storage events fire in all windows and tabs of the browser, this should not be assumed because few browsers implement this. Notice that if the storage is cleared, the event does not contain any information about the deleted key-value pairs. getKey Returns the key being changed. getNewValue Returns the value of the key after the change, or null if not changed or if it is the result of a Storage.clear() operation. getOldValue Returns the value of the key before the change, or null if not changed or if it is the result of a Storage.clear() operation. getStorageArea Returns the SessionStorage or LocalStorage object where the event occurred. getURL The address of the document in which the change occurred. The following snippet shows a sample event handler registered with a storage, where the changes from the incoming events are displayed in a UI label.